Meet our Athlete of the Month for November! Briana (Bri) participates in Bowling, Cheerleading, Basketball, Ballroom Dance, and Track & Field. She has earned many awards from competing in Special Olympics such as the medals that she's wearing pictured left which are from bowling (gold!) and ballroom dance. In addition to her involvement in Special Olympics, she volunteers at the library 2 days a week, helps out with Meals on Wheels and enjoys spending time with her friends and family. She also loves to watch movies and her aunt says she can name the actors from most any movie! Bri was nominated as the athlete of the month because of her positive attitude and beautiful smile. She always seems happy and isn't afraid to try new things such as Cheerleading. Bri's great sportsmanship and generous spirit exemplify what our "Spirit" team is all about. Q: Who is your favorite singer / group? Eric participates in Basketball, Bowling, Bocce, Track and Field, Equestrian, Swimming and Ballroom Dance. He has earned numerous awards throughout the years including some recent gold medals at the Horse Show and at State Games. He also just got 1st place in the Area 8 bowling competition with his team "The Applesauce Gang" and will get to compete in the State Bowling tournament in December. In addition to his involvement in Special Olympics, Eric also works at Sycamore Services and enjoys Thursday night Bible study with his friends (and going out to dinner beforehand!). He also likes to ride in the "Party Bus" with his friends and bowling partners. Eric was nominated as the athlete of the month because of his good attitude and sportsmanship at bowling each week. He comes to all of the practices, is always prepared when it's his turn and has a lot of fun and makes it fun for everyone else. Aside from being a joker and a chatterbox, Eric has a big heart and has touched the lives of so many people. This was evident at his recent 30th birthday party with an open-ended invitation to all of his family and friends and he requested donations for charity in lieu of birthday gifts. Karleigh participates in Bowling, Track & Field and Equestrian. She is a serious competitor and excels in each of her sports. 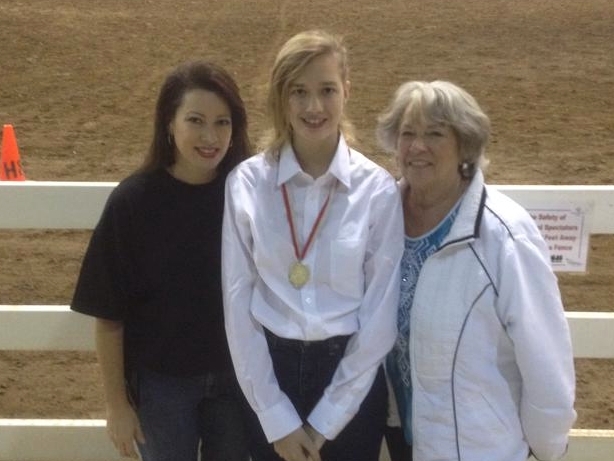 Pictured left (with her Mom and Grandma) Karleigh's wearing a gold medal that she recently earned at the Horse Show at the Hendricks Co. fairgrounds. Karleigh was nominated as the athlete of the month because of her mature and independent attitude and model behavior as an athlete. She had to face some adversity at the Horse Show and she handled the situation with grace and maturity. She sets a great example for her peers and everyone agrees that she is super cute and always strives to do her best! Q: Who is your favorite singer/group? In Howard's 33 years of participation in Special Olympics, he has competed in Bowling, Bocce, Basketball, Track and Field, Volleyball and Softball. 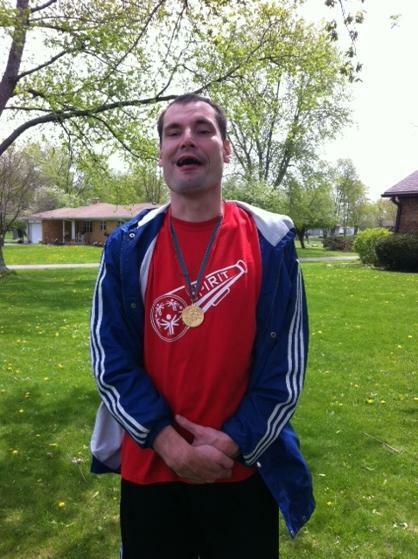 He has earned numerous gold medals over the years and most recently earned a bronze medal in Bocce this past June in Terre Haute at the State Games. In addition to his involvement with Special Olympics, Howard also has a job at Kroger in Avon. Howard was nominated as the athlete of the month because of his fun and positive attitude at bowling. Every week he buys pizza and shares with everyone. He is a serious bowler (he recently shot 180 and 197!) but also has a good time and makes it fun for everyone around him. He is especially funny when he has 2 strikes in a row and is going for the turkey - Gobble-Gobble!! A: 28 yrs with Indy Parks and 5 yrs with Hendricks Co.
Marci participates in Basketball, Track & Field, Swimming, Bowling, Golf, Equestrian and her newest sport - Cheerleading! In addition to staying active year round in all of these sports, Marci enjoys bible study and going to church as well as helping out at Sycamore Services and AWA. She also has a job at Chicago's Pizza. Marci was chosen as the athlete of the month for her sweet disposition. She is known as a real sweetheart and has a positive effect on everyone around her. But beware, she is known for her surprise tickle attacks when you least expect it!! Marci's fun-loving spirit and her smile are contagious. Josh participates in Bowling, Bocce, Basketball, Track & Field, Dance and Golf - wow, that's a lot of sports!! As you can see, Josh is active in Special Olympics year round and recently attended the 2014 National Games in Princeton, NJ. Josh bowled as part of Team Indiana with his unified partner (and brother!) Matt along with another unified team. Pictured left is Josh displaying his multiple awards from Nationals. Josh was chosen as the Athlete of the Month for June because of his positive representation of our county and state at the 2014 National Games. It's no surprise that Josh was selected to attend Nationals, he is a true competitor while also being a gentleman. Josh is always courteous and polite to everyone around him and has a positive impact on our group of athletes. He also attends the monthly board meetings as the Athlete Representative and recently shared at a meeting his overall experience at Nationals. Q: What will you remember the most from your experience at the 2014 National Games? Sara participates in Bowling, Track & Field, Dance and Equestrian. 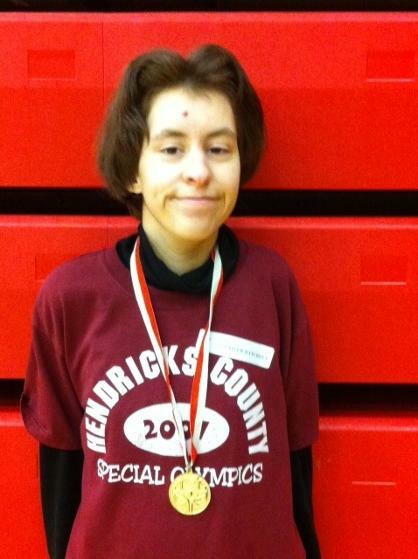 With her mom Sandy as the County Coordinator, Sara attends all events and is a very well known athlete in our county. This is evident if you ride in the wagon with her in the July 4th parade as you will hear her name called out over and over from people that know her. 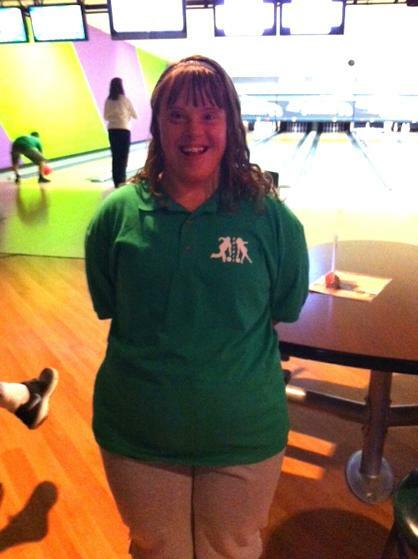 In addition to being so involved with Special Olympics, Sara works two jobs. Sara was chosen as the Athlete of the Month for May because of her helpful attitude and dedication to trying out a new sport - Bocce. She has been attending all of the bocce practices and participating even though she is not yet eligible to compete (not until age 30). She always helps to pick up the bocce balls for the athletes that have a harder time bending down to get them. She is developing her own style in bocce and is improving each week. Sara recently earned two first place blue ribbons (pictured left) at the Area 8 Track & Field event at Ben Davis in the 25M Walk and the Softball Throw. Q: What other things do you like to do besides Special Olympics? 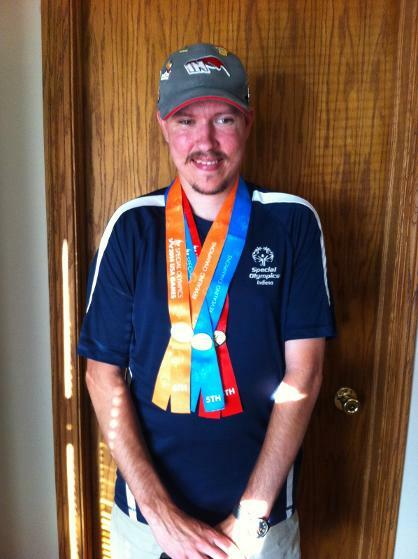 Mark has participated in numerous sports throughout his years with Special Olympics including Basketball, Bocce, Bowling, Track & Field and Swimming. His mom's proudest moment of him in Special Olympics was when he was a gold medal winner in the 25m backstroke at the 2009 State games. He also has tried Volleyball and Golf although his mom says he hits worm burners in golf! Mark was chosen as the Athlete of the Month for April because of his enthusiasm, dedication and great sense of humor. He always tries his best at Bocce, attends all the practices and throws a nice ball - even with the occasional mistaking of his partner Greg for the pallina (we know it's no accident!). A: Anyplace that serves food! Jennifer participates in basketball, track & field and bowling. She is interested in trying Dance and Golf and has previous experience in Bocce. She earned a gold medal (pictured left) for bowling at the 2013 State Games in Terre Haute this past summer. Jennifer was selected as our very first Athlete of the Month because of her positive attitude and smiling face! She always displays good sportsmanship by being respectful to the coaches, volunteers and her fellow athletes. 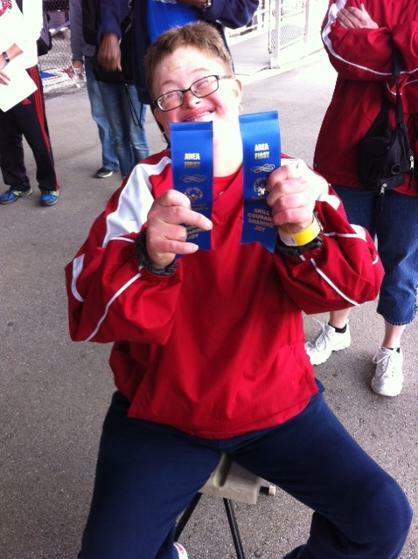 Q: Why did you join Special Olympics?